I got me a job a few weeks ago. I’m working as a barista/server and a brand spanking new pastry café! I didn’t think this is something I’d want to do with myself but it just worked out. I went in there to meet someone from couchsurfing and casually just asked the owner is she was hiring and two days later I was working. It was a random occurrence that I can thank couchsurfing for! This girl that I met was also a blessing. Her name is Meghan and is super fun, artistic, music loving, and just awesome. She works for the theater downtown so she gets free tickets for herself and friends for events and I’ve been able to see the symphony, the Moscow Circus, and a Verdi opera for free. After the show one night we went to play on all the ice sculptures they have in their courtyard/ ice skating rink. I got a call on a Saturday night from my friend Dave whom I spent a lot of time with while I was studying abroad in London. It was through Dave that I met Matt and thus moved to Alaska. He says I must come to Fairbanks to hang out so thus the adventure starts. I get a ride, I loose a ride, I can’t get a hold of Dave, do I go? I find a ticket, wake up on Friday and say “I’m going to Fairbanks today!” and then couldn’t book the ticket so I go on Saturday morning instead… nearly miss the flight, no security, walked into airport ten minutes before flight is to leave after taxi races me there and made it! Yay! At airport I was picked up by a couchsurfer named Ben. Since he was in contact with me I figured I’d just hang out with him but Dave decides to call me again. Miscommunication occurs and I never hear from Dave the rest of the time I’m in Fairbanks. Fairbanks is an interesting place… not one people just randomly come to visit, but has so much uniqueness to it. First, the negative is always implied while giving the temp. “what’s the temperature today?” “oh, about 20”… that means negative 20, which was the average temp while I was there. It was zero when I got off the plane and when walking around the musk ox/caribou farm, a research facility part of the university Ben is staying at for the winter, it was about zero and I was pretty cold. Later it was about -20 and it felt exactly the same, no worse and definitely no better. Hmmm. Since the weather is so cold in Fairbanks everyone has a plug in for their car to keep it warm and to make it easier to start. Every parking space has a place for you to plug your car in. That to me was the most interesting part about Fairbanks, and it’s not unusual outside of it. Brian was in Fairbanks at the same time and they didn’t have a plug in for their vehicle… needless to say it didn’t start the day they needed to go home. 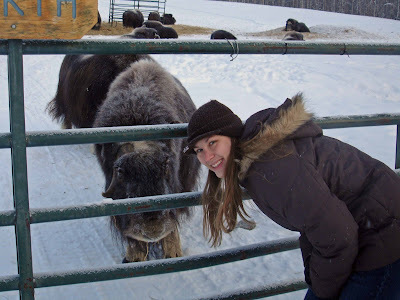 The musk ox/caribou farm: lots of barns and places to hold the animals. They keep the female and male musk ox separate because they like to fight. Ben stays on the property, which is locked to the public during winters (you can get tours in the summer), as a night man just so someone’s present in case of anything. This is a perfect gig for Ben, a true Alaskan; born and raised. Ben is from Wasilla, north of Anchorage (maybe an hour’s drive). He has a car, but prefers to ski the three miles to school when he can… and remember the average temp is always in the negatives there. The house, which has housed many people before him doing similar things, he leaves at a steady 50 degrees while it’s just him there, he turns it up for guests. There is no running water to the place, so he has huge jugs of water he buys monthly which he uses to drink and cook with. There is a nearby building that has a shower, toilet, running water, etc. It’s very well heated, but a good 50 feet from the house so whenever I needed to go to the bathroom I’d bundle up and run to it so the cold didn’t sink into my clothes. I think the floor was heated too so it was nice when walking barefoot in there. Ben however, has no problem waltzing to this facility in just a tee-shirt in -20 degree weather. 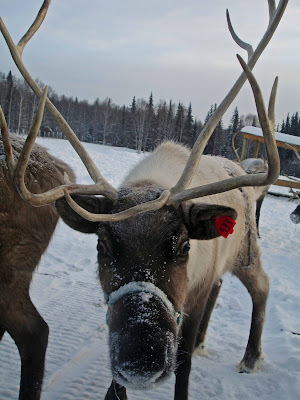 I learned the difference between reindeer and caribou while I was at the farm… not much, they’re pretty much the same animal… but reindeer may have been slightly domesticated at some point so are a little smaller and shorter. They had both on the grounds. Both the musk ox and caribou are no strangers to us humans, they would waltz right up to us when we came near them. Though I could touch them, they didn’t like it. They just wanted food. Musk ox fur is incredibly warm and worth a crazy amount of money. You won’t just find musk ox in Alaska unless you go way way north, so it was kind of a special treat to be able to not only see them, but touch them, and get a clump of their fur as a souvenir. I helped Ben make a dinner for some friends he invited over, salmon chowder. I got to meet some of his friends. 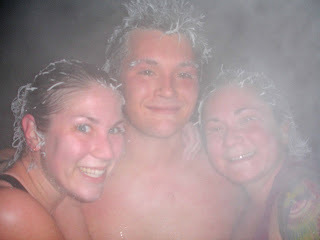 Ben and I had been talking about going to the Chena hot springs after dinner and tried to coax these folks into it too. We only got one girl to come along, Lily. So we head to the springs at 9:30pm and it was about a 50 minute drive. The drive was beautiful because the northern lights were out and they hovered in the night sky entertaining us as eye candy as we drove. The Chena hot springs is a pretty touristy hot spot for Fairbanks, they are natural springs that they’ve harnessed into a pool for use by people… but because they are naturally so hot, they have to pump in cool water to keep it from scalding us. The temp outside was -20 degrees again, give or take five degrees, and Lily and I weren’t too excited about walking out into that kind of weather in just a bathing suit! The place is made into a resort, they have a place for you to change into your suits and take a shower… then you walk out into an area where there’s an indoor pool and hot tub. Then you have to walk outside to get to the hot springs… and that first blast of cold air and the realization I was walking on ice with my bare feet made me think “what the hell am I doing! ?” It was dark out so I couldn’t see where I was going either, just followed the walkway. Then we saw the springs… the reason it was hard to see was because of all the steam, the mix of the water which should be about 146 degrees, hitting the -20 degree air. I hear someone call out “watch out it’s cold!” and I actually believed him for a second, but on the contrary, the moment my foot went in the water I was in pain. It was so hot it burned! Especially since my feet were just walking on ice! I managed to get my body under the water and used to the feeling. It was so crazy how steamy it was. You couldn’t see but a few inches in front of you, despite the few lights they did have (to set a soothing mood). We came up with calls to find each other through the steam. The pool was pretty big, about the length of a real pool but all the same depth and was surrounded by big rocks, all covered in snow. I was wondering why the snow didn’t melt with the steam floating around it, but it obviously wasn’t hot enough to melt the snow. 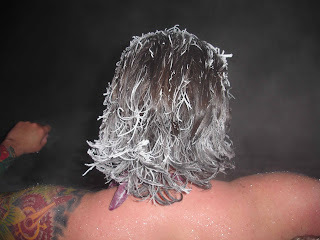 It was enough to make my hair moist and then freeze though. At times I was really uncomfortable because either you were too hot in the springs or too cold when you climbed onto the rocks to sit in the air. We decided to venture to the far side of the pool… however the first trek there was fine, we noticed one spot of very very hot water and just quickly moved through it. But I went to go get my camera so I had to pass through it again and by this time it was incredibly hot. The water is fed to his man made area by pipes, we found one that pumped in cool water and spent our time there because the water is just that hot. Well, I must’ve hit a section of water that didn’t get cooled because it scalded me, all three other times I had to walk through it. 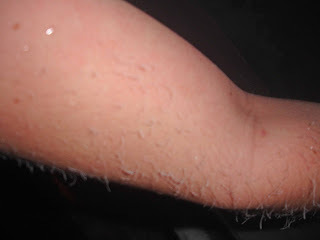 It hurt bad enough to bring tears to my eyes and leave my skin red and raw on my upper torso. The steam would sometimes clear and would’ve been great for pictures, but I think as the night went on they slowly turned off the cool water pipes because the steam got very thick in the end (and that could explain why it hurt so bad the last few times walking through that hot section, it didn’t scald the first time). I took pictures, but the steam clouds them. However, at a wonderful moment of our unique blissful adventure, the five of us in the section of the pool distracted by our situation and picture taking attempts had our attentions called to the sky. We looked up and not even the steam could cover the northern lights that danced over us. Our chatter was silenced in an instant as we watched in awe. Since that moment I couldn’t think of what fortune has landed before me. 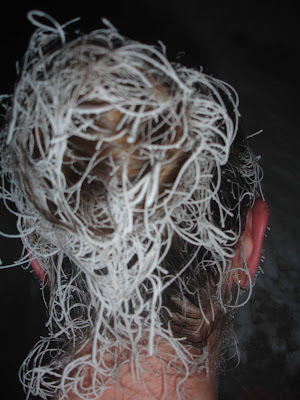 I choose to go to Fairbanks on a whim, stayed with a complete stranger who took me to this amazing place and I’m standing here experiencing something truly bizarre… being scalded on my body while my hair remains in a frozen cocoon on my head… and I’m surrounded by great company. Unfortunately, our nature loving situation disappeared when we were called to vacate the springs… Lily and I were the last out of course, taking our sweet time enjoying every last moment of it before having to walk over the blasted ice to get back inside. I’m surprised more people don’t slip and hurt themselves cause I nearly lost it a few times. We dressed and left talking the whole way back about how great of a night it was and how amazing each other’s company was. At about 1:30am we decide the night’s not over and go to a club called The Marlin where a live funk band was playing. The next day I made a valiant attempt to locate Dave by breaking into his house and going to his office. No seeing of Dave, so I go to spend the rest of my day before leaving with Lily to allow Ben to go be a good student and study. Lily and I talked and talked and it was so much fun. It’s amazing when you find people that really just bring joy in your life with little effort. I admire her a lot with her carefree spirit. Alaska and hippies are almost synonyms. It was a great trip. Things in Alaska are great, there’s so much to do and I’ve met so many people. When I don’t work, I split my time between climbing or skiing with Bill, which is usually followed by making a fabulous meal which I get to help out with, going to the various events at the Bear Tooth Theater pub, Humpy’s downtown for hanging out with friends or playing trivia there (my team was third place last Tuesday! ), and finding other various things to do. Bear Tooth, though, is quite the place! I first discovered it when Brian took me to the film festival there. I’ve been to a few a movies there since, which are only $3. They are films that are not new to the big screen, but haven’t yet come out on DVD yet. You have to be over 21 to get in because they serve beer and food so you have tables in front of you for everything. This is a happening spot, lines are ungodly long when you go. The pub is in junction with a restaurant called Moose’s Tooth (both of these places are named after mountains… I know Moose’s Tooth is an incredible climb, probably more difficult than Denali, but since Denali is so well known people only come to climb that). They are both linked to a brewery and every month they introduce a new beer and have a big celebration on the first Thursday of the month. It’s called First Tap and during the winters it’s held at Bear Tooth. This Thursday they brought in this crazy funk band and took out half the seats in the theater and had a great little party. I couldn’t believe how many people I’ve met since I’ve been here. I recognized so many faces from all over, too many people to really spend a lot of time talking to. Those I didn’t know were so friendly, this is the Anchorage way. When you’re up dancing with everyone else, you are all pretty much friends. You talk to one another like you’ve met them before, laugh and dance together. Alaska is great. Hello. This post is likeable, and your blog is very interesting, congratulations :-). I will add in my blogroll =). If possible gives a last there on my blog, it is about the Home Broker, I hope you enjoy. The address is http://home-broker-brasil.blogspot.com. A hug.